Human activity has had a dramatic effect on our world. Shopping malls stand where forests once stood. A once pristine beach is now a concrete wall at the foot of a condominium. Factories pollute our rivers. Trawlers are racing to pull all the fish out of the sea. The question is – “why do we do it?”, particularly since we know the consequences. The explanation is simple. People do what they are incented to do. Since Nature provides the services that sustain us for free — that is, we don’t pay for them — we consume them at unsustainable levels. Dr. Pavan Sukhdev heads up the United Nations Environment Program’s Green Economy Initiative where they try to understand this question and more importantly how to incent us to behave differently. He says that the cost imposed on society for the degradation of ecosystems through the legal actions of corporations is between $2 – 4 trillion per year. That’s an amount roughly equivalent to the financial losses of the 2008 banking crisis. For a quick introduction to the topic check out this video. Given that we do what we are incented to do, putting a price on natural capital is our best choice. None of us wants to be responsible for causing the last forests to be cut down or catching the last fish, do we? Yet our current economic models are driving us there. Rather than waiting for the economic apparatus to be implemented, we are valuing the natural capital in coffee growing regions by choosing certified Bird Friendly coffee. 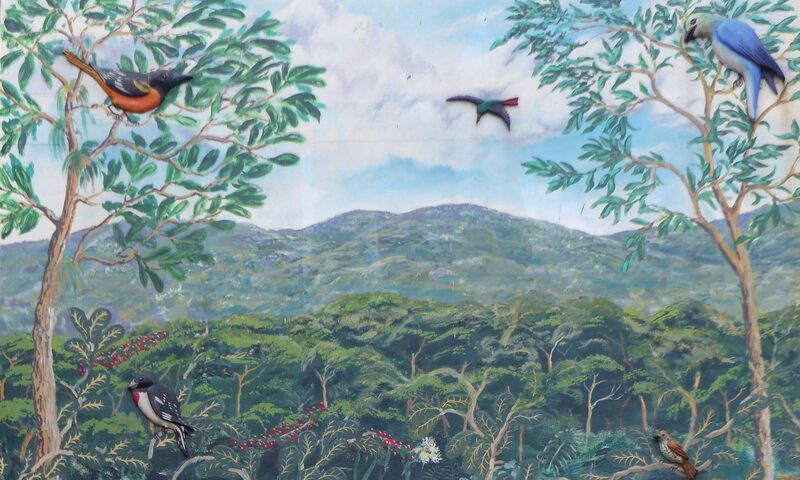 Bird Friendly coffee farms provide many services including habitat for wildlife, water retention and purification, pollination, pest control, carbon storage, soil erosion protection to name a few. Meanwhile, in pursuit of higher yields, coffee farmers are encouraged to cut down forests so they to make more money. Sometimes they do make more, but even when they do, the forest, and all the services that it provides, are gone. The land becomes an Eco-desert. Those services that ultimately sustain us are no longer provided (at any price) and our ecosystem is one step closer to collapse. So by choosing certified Bird Friendly coffee we are rewarding farmers for protecting habitat and natural services. Our eco-system has so far proven to be remarkably robust in the face of our unchecked consumption, but there are signs everyhwere that we may be reaching its limits. Is it not be better for us all to pay the farmers to keep the forest and have it continue to provide “eco services”? We think so. What do you think? Is Earth Day Really Over? Last week, on Earth Day I happened to see a broadcast of American Experience’s “Earth Days” documentary on PBS. I’ve been thinking about it ever since. Did you know that the first Earth Day was organized 42 years ago and marked the consolidation of the environmental movement as a political force? As someone who grew up in the 60’s and 70’s it struck me is what a huge impact the movement had on my personal view of the world. Its collective voice and momentum gave me the sense that we can save the natural world from human imposed ruin. The Environmental Movement had some really big wins in those days. Banning DDT, expansion of National Parks, and the creation of the EPA to name a few. They are the reason we have Eagles today and we have relatively clean air to breath and water to drink. In striking contrast, it dawned on me that not much has happened in the 30 years since. The tremendous policy advances have pretty much stopped. Sure we have a small number of Hybrid Cars and a few more solar panels and LED lights – but what progress has there been towards creating a truly sustainable economy? Very little. In fact, I would argue it has been a time of backslide and greenwashing. Meanwhile, the international scientific community warns us of the effects of human induced climate change, and in response, we elect governments who ignore the science and marginalize environmental leaders. It is now a week after Earth Day. The commercial rush is over. There are no more “green” inducements from the big brands because the commercial machine has moved on the the next big promotional opportunity… Mother’s Day. What about Mother Earth? Is Earth Day really over? This post is to bring you a few of the beautiful photographs taken by Vincent Falardeau in our back garden in the Long Branch neighbourhood of the City of Toronto. These birds spend their winters on shade coffee farms in Central and South America. Traditional rustic coffee farms are the last refuge for these beautiful creatures as their formerly lush wintering grounds are deforested. We want you to understand that they are here. And that the most effective thing you can do to help them survive is to drink our Certified Bird Friendly coffee. See more of these amazing photographs in Vincent’s exhibit at our café. Earth Hour is actually a pretty good idea. It gives people a visible way to express their concern for the environment. As we are such social creatures, it spread from Sidney, Australia, all around the world and has become a huge world-wide event. It represents a wonderful opportunity for generating impetus to make positive change and elegantly demonstrates that many small changes really add up to make a difference. However – the experience will only make a difference if we use it as an opportunity to make real changes in our daily lives. We mustn’t get so involved in the moment — the hour — that we look out in the darkness and see our collective accomplishment as the goal. It is a demonstration. Let’s use Earth Hour as an opportunity to make a permanent change that lowers our footprint on the Earth. Things that you do every day or every week have the most impact. For example, in the Café, we just changed our sandwich bread from a high quality conventional bread to a certified organic bread (we already use certified organic meat, eggs, dairy and veggies). So there are fewer chemicals and pesticides going into the environment and more farmers are being rewarded for employing sustainable methods. This is a small change, but a positive one – we make sandwiches every day and the increased cost is relatively small. And of course, our favourite, switch your coffee to Certified Bird Friendly, Organic and join us in preserving essential migratory songbird habitat. So let’s turn out the lights tonight and let us know what you will do to make Earth Hour last forever. What’s the Deal with the Birds? Upslope is a shade coffee farm. Downslope is sun coffee. Something we get asked often about our name — “I get the Beans, but what’s the deal with the Birds?” The answer is that we started the company to import, roast and sell Certified Bird Friendly® coffee in Canada – something that no-one was doing at the time. We chose the name to highlight the link between the coffee you choose to drink and the Migratory Songbirds that you see in our back yards, parks and forests. You see – “our” songbirds aren’t really ours at all, we share them with the people of South and Central America. Every winter, they fly south to spend the winter months in tropical forests. At least that’s what they’ve done for the past several hundred thousand years. Over the past 40 – 50 years, we in North America have seen dramatic decline in Songbird populations and, it turns out, that one of the major causes of this decline is winter habitat loss. We are losing tropical rain forests at an alarming rate – mostly they are being cut down for agricultural purposes — for sun coffee, for other crops and for cattle. When the birds that used to winter in a forest return to find that it was turned into a sun coffee farm, they have struggle to find food and don’t gain enough fat reserves for the trip back to their breeding grounds back here in North America. They arrive back later, breed less successfully and those populations are in steep decline. The thing is, coffee likes to grow in the forest! So why are we cutting it down to grow coffee? To increase yield of course. It is pretty depressing really until you realize there’s something we can do to help stop the trend. We can support traditional rustic shade coffee farms that do provide winter habitat for our migratory songbirds. The coffee tends to be better too. Drink a cup a day from these farms and you’ll be responsible for preserving about 1,750 sq ft of bio-diverse habitat for birds and other creatures. That may not sound like a lot, but multiply that by the millions of cups of coffee that are consumed by Canadians every day and we can have a huge impact. This brings us to a key question – “how do you know if your coffee is really helping preserve habitat for migratory birds?” Easy – just look for the Smithsonian’s Bird Friendly Seal. It is the only way to be sure. We’ll discuss it in more detail in a later post but the Bird Friendly Certification guarantees that a coffee farm provides habitat for birds by measuring against criteria developed by the Smithsonian’s scientists. So you could say that the certified Bird Friendly farms are scientifically proven to provide habitat for our migratory birds. Most importantly, the Bird Friendly certification was not developed by the Marketing department of a coffee company. So that’s the deal with the Birds. We became a coffee company to help the birds by bringing you beans that preserve their habitat. Drinking it is something easy and delicious you can do every day to help save our migratory songbirds.